Postcard US-2849038 to Texas was a 14-cent postal postcard issued by USPS in 1987. It features a mountain-lake scene with brilliant blues and rich greens at the National Elk Refuge in Jackson, Wyoming. It was part of the "Take Pride in America" national public awareness campaign to encourage people to take pride in the nation's natural and cultural resources. According to an AP Newsfeatures article in Lawrence Journal World on September 20, 1987, "launched by President Reagan in his 1986 State of the Union message, 'Take Pride in America' has been a major campaign to ensure the wise use and stewardship of our public lands - natural resources that belong to all Americans." The National Elk Refuge was created in 1912 to protect habitat and provide sanctuary for one of the largest elk herd in the world. The refuge is home to an average of 7,500 elk each winter. and receives nearly one million visits annually. 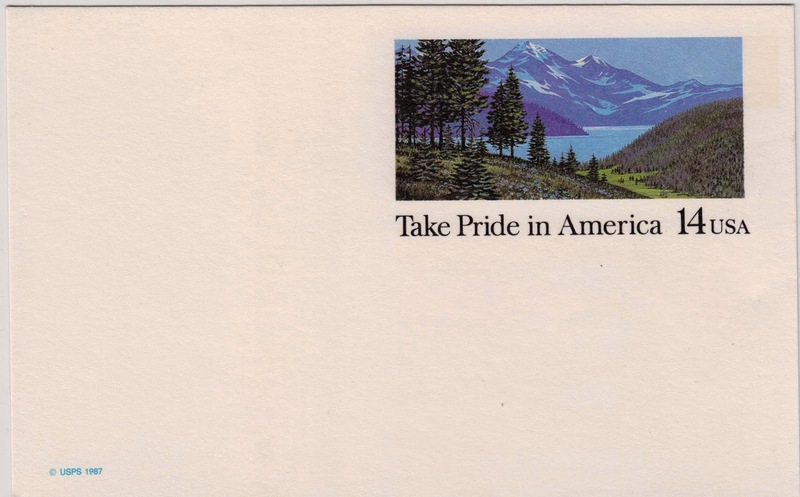 The domestic postcard rate, according to Akdart.COM, was 14 cents between February 17, 1985 and April 3, 1988. Yet, another stamped postal postcard issued in 1980 also had a 14-cent postage when the domestic postcard rate was 10 cents. On an unrelated note, USA team was edged out by Belgium 1:2 at the 2014 FIFA World Cup in a Round of 16 match at Arena Fonte Nova in Salvador, Brazil on July 1, 2014, but not without a fight. The USA Team exceeded the expectation as many did not believe it would make into the Round of 16. "Man of the Match" Tim Howard, who set a World Cup record by making 16 saves, said before the match: "we’re proving critics wrong." We are still proud of the United States Men's National Soccer Team, and are optimistic about their future despite of a loss.